worm castings or worm compost? 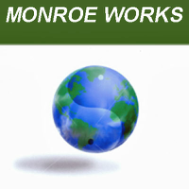 Every wondered what the difference is between worm compost (vermicompost) and pure Black Castings™? The term vermicompost means organic material that has been composted by worms. The actual amount of castings contained in it and the degree to which the material has been composted will vary widely from product to product, location to location, and dates of manufacture. Black Castings™, however, are always 99.9% pure worm castings, meaning the quality and purity of the castings are consistent and will not vary from bag to bag, ever. They are manufactured indoors in climate controlled conditions, guaranteeing that our worm castings always maintain their pure composition. You know what you are getting and the results you receive are consistent for each application. Worm compost (Vermicompost) is an excellent soil amendment and greatly enhances your growing medium. However, by using pure Black Castings™ you are always sure you’re getting the highest concentration of the highest quality worm castings. You receive a greater value for your money spent and you achieve better results while using less product. "How can you tell the difference between run of the mill vermicompost or even ordinary worm castings and Pure Black Castings™?" First of all, pure Black Castings™ has the appearance of black coffee grounds. 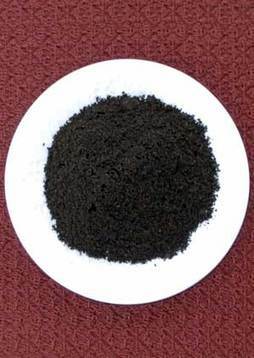 Place a bowl of vermicompost and pure Black Castings™ side by side and leave them to dry. The comparison is dramatic. 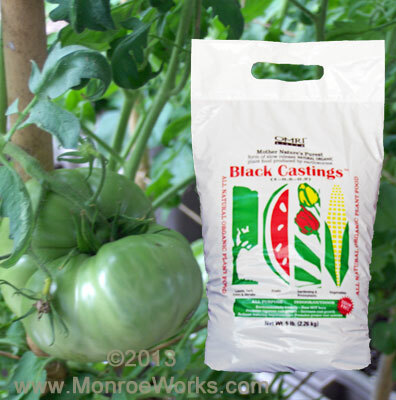 Pure Black Castings™ are bagged with very low moisture to begin with. After completely drying out, you can clearly see they still retain their black granular appearance. 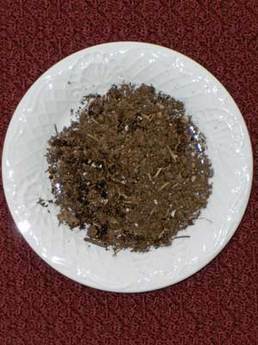 The vermicompost, once dried, has a much lighter, brownish appearance and feels powdery and light weight. Place 4 oz of Black Castings™ into a wide mouth jar. In a second jar, place the same amount of another brand of worm castings or worm compost. Fill both jars to about ¾ full with tap water, shake well and let them stand for 5 minutes. Check for unconsumed organic materials, like seeds, wood chips, peat moss, finely ground leaves and stems. Vermicompost will usually contain large amounts of these undigested materials. Check the bottom of the bottles. If there is sand, it may have been added for weight or sand can usually be found in composted manures.Pour off the water and examine the sediment. If it still looks like worm castings, then it’s worm castings. Worm castings are slow to dissolve because they are coated with calcium as they pass through the worms. If your jar of vermicompost looks like mud, then it has low castings content and is just simple compost. Pure Black Castings™ are guaranteed to be 99.9% all worm castings with very low moisture content and NO fillers. When you purchase Black Castings™, you are getting what you paid for – worm castings and nothing but worm castings. Are 100% certified organic worm castings. Contain minerals and natural soil microbes with a high bio-diversity. Contain no weed seeds or nematodes. Are free from E-coli and Salmonella. Want to know exactly what you are getting? Then for quality assurance and guaranteed consistency, make pure Black Castings™ your choice.